I am in need of help removing the fuel tank from this truck listed above. I have one strap off and the other one loosened. The one that is loosened will not come out all the way. What we are trying to do is replace the fuel pump. Any one have any ideas how to get the fuel tank all the way off? Thanks for your help in advance. Is this a rust issue with the nut + bolt for strap? No the bolt is all the way out it is just the strap that we cannot remove from around the tank. The strap that I am talking about is hooked to a bar that is hooked to the frame. I will try that and see if it works. Just so I am understanding this, you are saying to pull very hard on the strap to get it loose from the tank? It can be replaced if it breaks? This is a generic pic of what I think you are dealing with. One end has the bolt the other swings as I recall. All lines, wires and fuel neck off first if possible or as tank comes free (can be stuck on top also) have support while you deal with connections. They use like roofing material which gets pretty sticky sometimes and may have that on top of tank as well. The idea is no metal to metal contact which in use could rub a hole in the tank or make a spark as no matter how tight you make a vehicle things need some allowance to move with the conditions we put them under. The strap will pull off or call it peel off such that tank can be removed. If that insulating stuff is not up for reassemble ask your parts store or literally check out hardware store type product to replace it. Not sure you can buy what they call "ice shield" used here for roofing under shingles in small quantities but a tape or something should be available if it needs refreshing. Universal replacement straps should be an in stock item - depending on where you are. Here rust would look like in pic above as early as a five year old vehicle and of course you can't safely use heat to help. I've just taken tin snips to straps and either welded back or put a piece over cut with rivets to make it reusable in not cut in a spot as to rub on the tank. First get it out. If you are uncertain as to how to safely remove the pump + gauge sender assy hit back. REMEMBER - AN EMPTY TANK STILL HAS FUMES FAR MORE APT TO EXPLODE THAN FULL ONE WHICH IS TOO HEAVY TO DEAL WITH AND WOULD SPILL OUT WHERE FILLER NECT WAS SO IT MUST BE EMPTY OR VERY LOW. More: If the tank is severely rusted you may be surprised that for a common Chev truck they probably are NOT all that expensive aftermarket but made to fit right new one. Use wood between any jack or jack stand used for support between metal of those and the tank. Do keep a fire extinguisher right nearby and having a helper is really handy for a couple critical moments while doing this stuff. thank you for the help. The fuel tank came off pretty easy when we took the bracket that the one strap is hooked to. We are just having problems getting the fuel pump loose now. It does not have the quick connects. It has compression like nuts on each line. have any suggestions? Now I can't be sure of the exact type line connections and at the age they may have been altered. Pic above shows what looks like "flare nut" connections not compressions fittings that might have been used before with this old a truck to replace just the motor and not the whole assembly. Either way you should use "flare nut" wrenches as needed to undo. True compression fittings as a patch may not be legal with fuel! I'm not the police but common sense with items with fuel is in order. Do it right as OE. 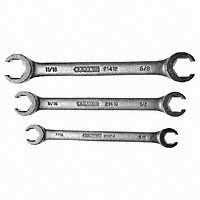 Those are basic flare nut wrenches. PB (power blaster) penetrating oil works as well as I know of to assist with that stuff. That what I call a compression fitting not generally used OE in automotive and definitely NOT for brake line repair! You are right it is a flare nut. We are replacing the whole assembly because the pipe that comes from the fuel pump has now snapped off because of us trying to get the flare nut loose. The problem we are having with the old flare nut is that it won't come loose from the gas line. It is rusted and stuck. We tried flare wrenches and vise grips along with pb blaster and they still will not come off. Any suggestions would be greatly appreciated. I know it's old but it should be done safely with gas involved of course.